Sometimes it’s hard to see the possibilities of a long-neglected back deck. But with a little love and a few good deck decorating ideas, you can turn your outdoor space into a place with a serious wow factor. Take for instance Jen Stagg’s complete deck makeover. She’s the creative mind behind the popular decor and DIY blog withHEART. And when we say complete deck makeover, we do mean complete. Jen’s deck went from being kind of sad to being an absolute showcase with a new pergola, outdoor lights, outdoor curtains and her DIY cement planters. She created her outdoor dining room for our Patio Style Challenge series– we send some of the best bloggers on the Internet a new patio furniture set to spark their creative patio decor ideas, which we get to share with you. Take a look at the gorgeous photos of her new back deck. And check out her many DIY ideas that went into this wonderful deck makeover, including the video tutorial for her DIY cement planters. You know those backyard living spaces that conjure dreams of summer nights, parties with friends, and relaxing over a beautiful outdoor meal? Yeah…. so I had opposite of that. It was an embarrassing, barren, boring back deck that we had put (very) far on the back burner while we focused on remodeling the inside of our home during the winter. After the snow melted, we were left with this. Shield your eyes my friends, it ain’t pretty…. Not only did the deck badly need a new stain job, but it also overlooks my back neighbor’s boat garage. Not the prettiest view. So when The Home Depot asked if I would participate in their Patio Style Challenge, I was thrilled to have a reason to focus on creating an outdoor living space my friends and family could finally enjoy. I came up with a priority list and began brainstorming how I could create an intimate, beautiful, cozy space that felt like an extension of our home. This is what I came up with. It’s hard to believe it’s the same space! We stained the deck, and built a pergola from scratch (see my video tutorial for the deck staining on my blog, withHEART), then we made a curtain rod system using galvanized piping and hung drapes made from paint drop cloths. I’ve posted a video tutorial for the curtain rod system on my blog. We added an ambiance and mood lighting by hanging string lights. A cluster of hanging lanterns give the look and feel of a light fixture, and the nifty battery operated faux candles I found at The Home Depot make them practical, safe, and easy to turn on and off. Take a look at my tutorial for the string lights and lanterns on withHEART. I wanted the space to feel like an outdoor dining room, and the Hampton Bay Fall River dining set was the perfect addition. 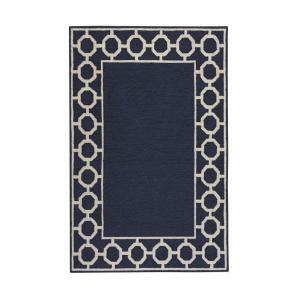 I selected a beautiful indoor/outdoor rug, also from The Home Depot, and went with the color scheme of navy, coral, teal, and white with touches of gray and gold. No outdoor space is complete without some greenery, in my opinion, so I made two different types of planters. I constructed a DIY hanging planter for a mini herb garden (see the video tutorial for the hanging planters on my blog), but here I’m sharing how I made these beautiful DIY painted cement planters. Watch this video tutorial for a full breakdown of what products I used and how I created the cement planters. I think they turned out so great! Such an easy, fun, and inexpensive project. This wicker chair and accent table you see below were finds from a local thrift store at $5 a piece. With a little repair work on the wicker, a fur throw, and a pillow, it added not only additional seating, but also made the space feel warmer and more inviting. There are so many lonely wicker chairs out there waiting for good homes– go spend a few bucks and rescue one! Inexpensive and functional seating for outdoor living. Throw in some colorful pillows, dishes, and of course, fresh flowers, and the scene is set for a cozy space perfect for entertaining. And thanks to the addition of the lighting, it just gets prettier as the night goes on. The deck glows and feels so warm and comfortable, and the drapes provide privacy if desired. Thank you to Home Depot for inviting me to participate in the Patio Style Challenge. It was so fun to create a soothing space using unconventional materials readily accessible to everyone. The mix of hard and soft came together beautifully. If you need me any night this summer, it’s safe to say I’ll be out here. Jen Stagg is a former award-winning reporter who now spends her time raising her daughter Ruby and fixing up her “peach and purple palace”. She writes about decor, home improvement and DIY on her blog withHEART. It’s full of great decorating ideas and tutorial videos. For more deck decorating ideas and inspiration, see other Patio Style Challenges as well as our Patio Style Challenge pinboard on Pinterest. And browse our online Outdoor Living Department for everything you need for your deck, backyard or garden. Style Challenge is a series of articles from guest contributors who aim to bring you fresh inspiration and ideas for your home and garden using a single Home Depot product as a starting point. Jen received the patio set from The Home Depot and a gift card. The opinions and ideas Jen expressed are her own.